Despite the old fashioned looks, some features on the TR04DAB are firmly in the 21st Century - touch sensitive controls, for example. Connectivity is limited to a headphones jack and a line output, meaning the radio can be hooked up to a separate speaker system. Bizarrely, there's no line input to allow the TR04DAB to double as a speaker for an iPod or similar. It's the touch panel that grabs the headlines, but it's not quite the finished article. In the centre lies a two-line blue LCD display and to its right side are five double-use presets for 10 DAB radio stations. The right hand contains controls for altering the volume, activating the blue backlighting, a standby option and something called BBS, which reveals itself to be a '3D sound' feature. While the design is functional and day-to-day operation is relatively simple, the touch panel does make things a little harder. As well as not being all that sensitive, the area of the black panel that is dedicated to each control is fairly small. Worse, the LCD screen itself is tiny, making scanning through digital stations quite a painful experience, especially since the viewing angle is awful, making the screen impossible to read unless you're looking directly onto it. Seeing as all the controls are hidden on the top, we're not sure the touch panel makes too much difference to aesthetics, as buttons would probably have worked better without blighting the TR04DAB's charm. Still, a by-product of this radio's physical presence is decent sound: the volume can be high without distorting and music is lent plenty of bass. 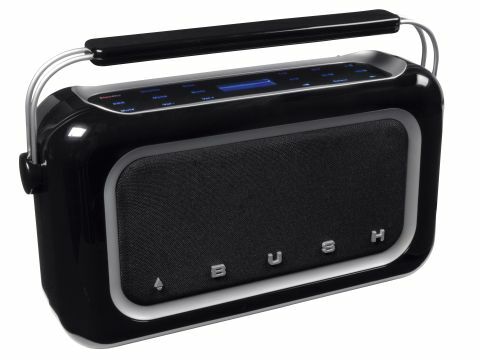 For those after a simple DAB radio for a kitchen, the TR04DAB is worth an audition, although its plastic look and touch panel take some getting used to.